I like winning things. When I won a toilet paper I ran across the house yelling, “I won, I won!” Having Mike Rowe give a shoutout when I won a year’s supply of Dirty Jobs Heavy Duty Cleaner was totally sweet. Yes, winning things can be a lot of fun. But in order to win prizes, you have to enter sweepstakes and giveaways. Right now, Shop Your Way has multiple SWEEPS for you to enter and win. With over 40,000 winners so far, you can win anything from points to use at Sears or Kmart to diamonds and dream vacations. 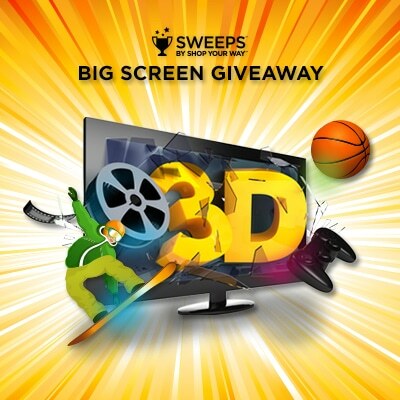 This week, one of the top prizes in a Shop Your Way SWEEPS is a 65″ 3D LED HDTV including shipping, accessories and installation – a nearly $4,000 value! One lucky winner will get the chance to kick back and watch their favorite shows and movies in big-screen style with this brand new TV. Are you ready for your chance to win? Just head over to the Shop Your Way SWEEPS page before 2/28/14 and enter to win. There’s no purchase necessary to win. Read the official rules for more details. What would you do if you won not toilet paper, not cleaning supplies, but a brand new 65″ 3D LED HDTV?